AdvertisementStill, it wasn’t just Apple; the entire PC industry contracted slightly in 2018. And it had a very bad Q4. Apple shipped 18.02 million Macs last year, according to preliminary data from market research firm Gartner. That’s down 5.0 percent from 2017, and the reduction lowered Apple’s share of the world market from 7.2 to 6.9 percent. Apple revamped the MacBook Pro and MacBook Air last year, but told those who want a new Mac Pro they’ll have to wait until 2019. The expection of a new high-end desktop could have cut into Mac sales for the year. The whole PC market shrank 1.3 percent in 2018, which is actually a smaller decline that in the past three years. Apple’s biggest rivals actually saw sales increase. Lenovo was up 6.9 percent for the year, HP shipments were up 2.1 percent and Dell saw a 5.5 percent increase. In this situation, Macs are treated as PCs. And these figures include desktops and laptops but not iPad, which has a significant effect on the totals. 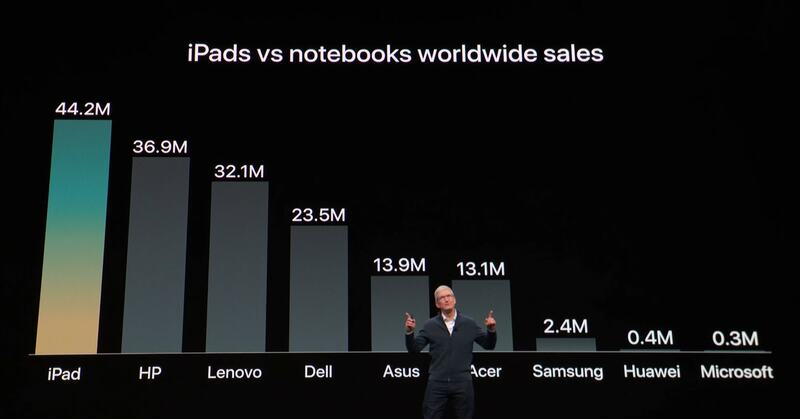 As Apple pointed out recently, its tablets outsell every notebook vendor. Mac sales declined last year, as did the entire PC industry. Globally, Mac sales dropped 3.8 percent in the fourth quarter of 2018 to 4.9 million. 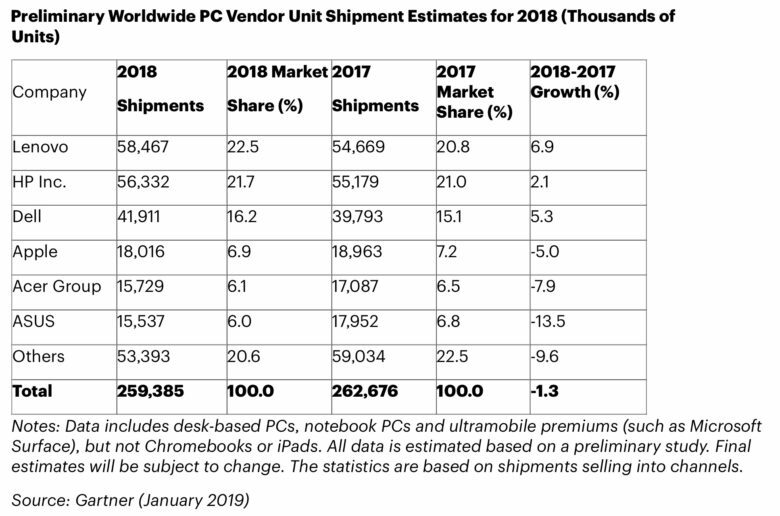 But the overall PC market did much worse so — down 4.3 percent — that Apple’s share of global shipments actually increased from 7.1 percent to 7.2 percent. In the US where this company is strongest, 1.8 million Macs sold in the October-December period. That‘s a 2.1 percent year-over-year drop. But again, the rest of the industry did worse so Apple’s share increased from 12.1 percent to 12.4 percent. Rival HP saw a 7.6 percent drop last quarter, while Dell rose 0.9 percent and sales of the Microsoft Surface line fell 12.9 percent. A standout was Lenovo who saw a whopping 23.4 percent increase in shipments, according to Gartner. Overall, PC shipments were down 4.5 percent.